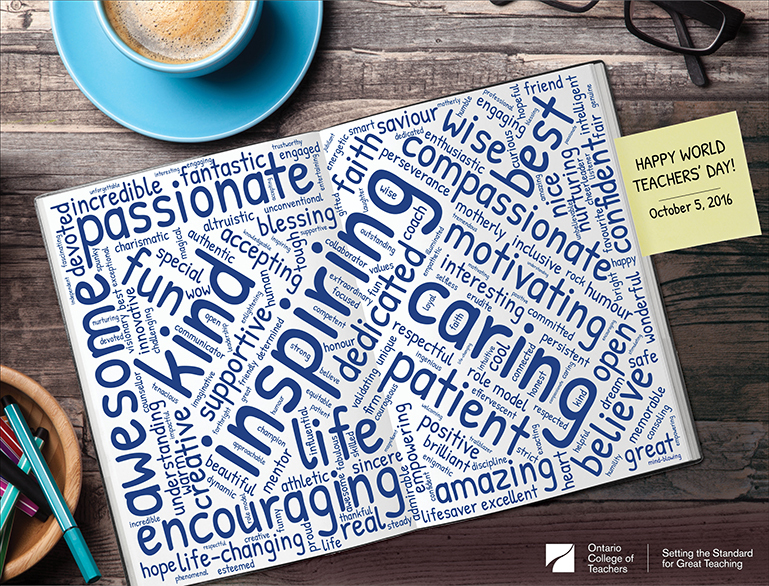 In a word, Ontario Certified Teachers are simply inspiring! One in seven respondents to our Just One Word social media campaign used the word “inspire” (or a version thereof) to describe their favourite teacher. More than 700 people offered comment, including 164 unique terms. By and large, we were told that one word simply wasn’t enough. Inspiring (15%), caring (7%) and kind (5.5%) topped the list of single-word responses. Other popular descriptors include: encouraging (4.9%), compassionate (3.2%) and motivating (2.8%). Passionate (2.5%) and awesome (2.2%) were also top of mind. The Just One Word campaign aims to celebrate World Teachers’ Day on October 5. See samples from this initiative below. UNESCO (United Nations Educational, Scientific and Cultural Organization) recognizes World Teachers’ Day as an international celebration of educators who must be empowered to build quality education and sustainable societies. See our news release here.